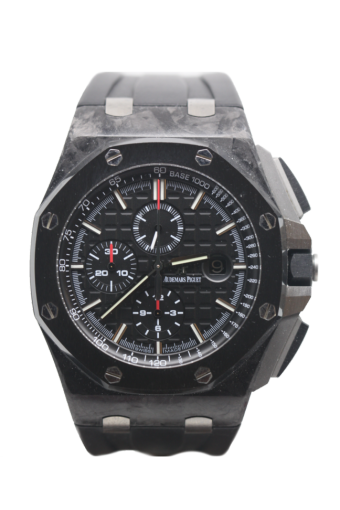 This is the rare discontinued edition of the 44m Audemars Piguet Royal Oak Offshore range and features both chronograph and date functions. The classic mega tapisserie dial is black with silver outer ring and red accents,the 44mm watch case is carbon fibre with a black ceramic bezel. Chronograph pushers are titanium with black ceramic caps as is the crown and all mated to the black rubber strap with titanium buckle. Cheshire Watch Company are supplying this watch complete with all boxes and paperwork which is dated 2012.